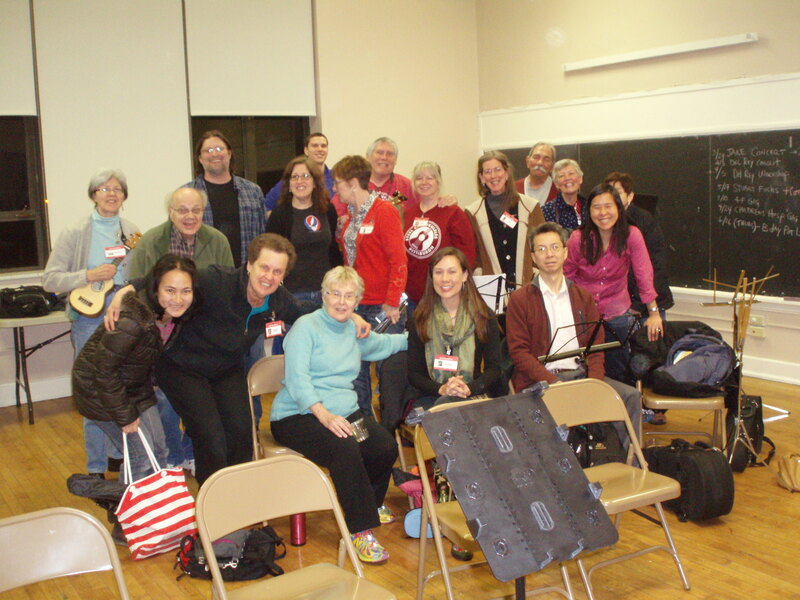 Two weeks ago, I returned to attending Steel City Ukuleles meetings after almost two months off, and I attended again tonight; my habit since starting out last summer has been to attend the regular first and third Wednesday meetings in Regent Square. Although I have been thinking of cutting back to attending once a month instead of twice a month, I was intrigued by the rather ambitious playlist Adam created for this week, so I couldn’t resist going, even though it meant conflicting with a newly revived regular French dance music jam that I haven’t attended in half a year. Adam started off with some easy blues, but soon we were launching into songs with pauses or other “irregularities”; these are always tricky because many of us don’t necessarily actually know the songs before we try to play and sing them and cannot guess right off the bat where they might be or follow along at the first attempt through. Also, there were songs that simply were very fast (meaning fast chord changes) or had complex chords and progressions. Very challenging, but I enjoy that. After the past half year since beginning on ukulele, I’ve figured out how to tackle hard music in Steel City Ukuleles readings. The thing to remember is that we always repeat a song at least once, and often more than once, and that within a song, there is usually a good deal of repetition as well. The trick is to never get held up on anything that you can’t do. Never pause. Always keep going, even if means just keeping track of where everyone is (or getting back on track) while not playing or singing for a while. Strum the easy, important chords. Also, given that many songs I simply have not heard before, I usually don’t start singing until I’ve heard someone else do a section. And since I can never fully remember the exact pitches of a melody on first listening, I like to just go with the chords and make up a new inner (or lower, since there tend to be more women than men at meetings!) voice harmonically. That’s especially fun when the chords are more complex; I’ve decided that singing in harmony is now actually my favorite thing to do as part of the group. This goes along with my recent focus on playing tenor and bass recorders with the Pittsburgh Pittsburgh Recorder group (rather than soprano and alto, which were my main focus during my first two years on recorder). That said, there’s a benefit to going back home to really “master” a song. I don’t like operating in perpetual “sight reading” mode. That’s part of why I like to sign up for performances sometimes, to really work on getting something down better. But I don’t think I’ll have time to perform again for a couple more months. Some of the songs triggered deep nostalgia in me. We did two songs by the great Stevie Wonder, “Isn’t She Lovely?” and “For Once in My Life”. I totally love these classic songs: great melodies, rhythmic clarity, harmonic movement. It’s always a joy to revisit these songs. We also did “America” by Simon and Garfunkel: a much sadder, wistful song that has a special meaning to me because I listened to it in my childhood, without necessarily grasping the words and the narrative, but absorbing the story just from the harmonic changes and the tone of voice in the singing. As we were all packing up to leave, Jack said we needed a group photo because it had been a while, so he got two in. Actually, I was sort of a de facto photographer for us since I joined last year, but I had disappeared for two months this year. (I did take photos two weeks ago when I returned, but Jack didn’t make it to that meeting.) I’ll continue taking photos as I attend Steel City Ukuleles events. I think it does encourage people to join when they see what a good time we’re having! After I got home, I realized my left fingertips were so sore that I could barely type at the computer. I was OK, but that was a really intense two-hour meetup! 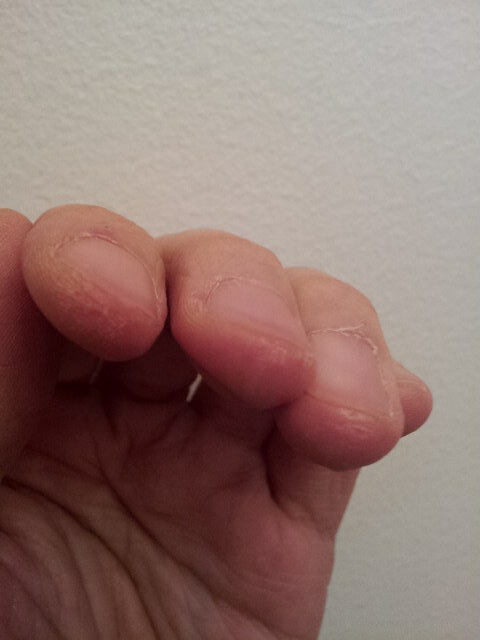 I’m still getting all my callouses back.